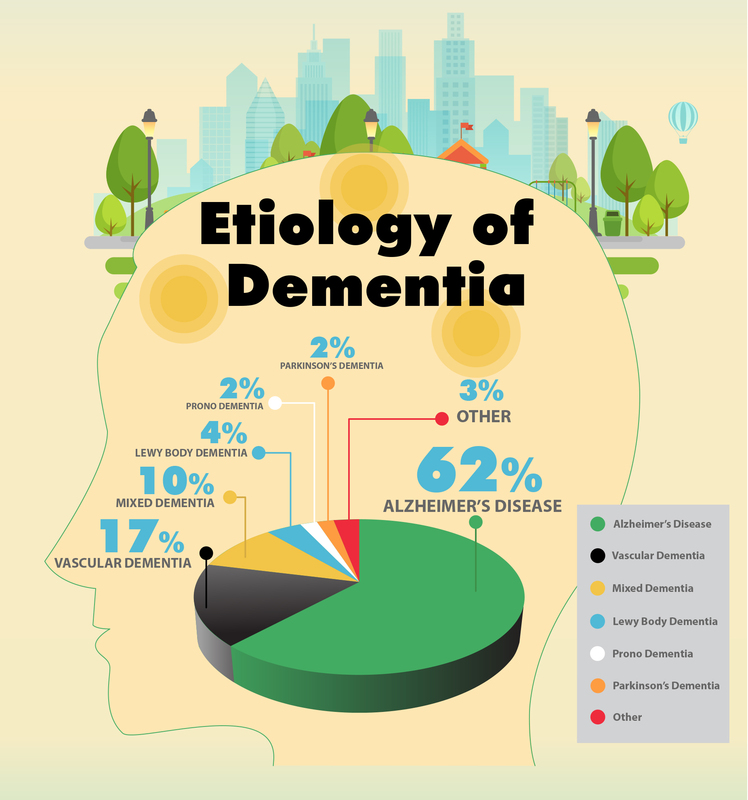 Dementia Statistics in the U.S.
Dementia is an umbrella term that describes several chronic and progressive diseases of the brain. Dementia becomes increasingly more common as we get older but it isn’t an integral part of the aging process. Everyone’s experience with dementia is different: from changes in behavior and reasoning to paranoia and hallucinations, etc. Women are more likely to develop dementia than men, and the symptoms that women endure are generally also more severe. With the aging of the Baby Boomers, by the year 2050, the number of people with Alzheimer’s is estimated to increase from six million to fourteen million. Cognitive and psychiatric symptoms tend to produce the most significant challenges for individuals with dementia and their caregivers. Dementia caregivers must pay attention to safety issues in the person’s daily activities such as driving, cooking, wandering, etc. The term “dementia”, in times past referred to as senility, derives from the Latin demens, meaning “out of one’s mind”. In the present day, the terms “senile” and “demented” are no longer used, as they carry with them negative connotations and stigma that can be hurtful to individuals with the disease. Dementia is a syndrome, an umbrella term that describes several chronic and progressive brain diseases, of which Alzheimer’s is the most prevalent. Dementia is also used to describe a number of symptoms related to a gradual degeneration in memory and at least one other cognitive faculty severe enough to cause dysfunctions in a person’s ability to deal with his or her activities of daily living (ADLs). Clinically, and in its broadest sense, dementia is characterized by “irreversible brain pathology” and the resulting cognitive impairment, and it looms today as a public health crisis. 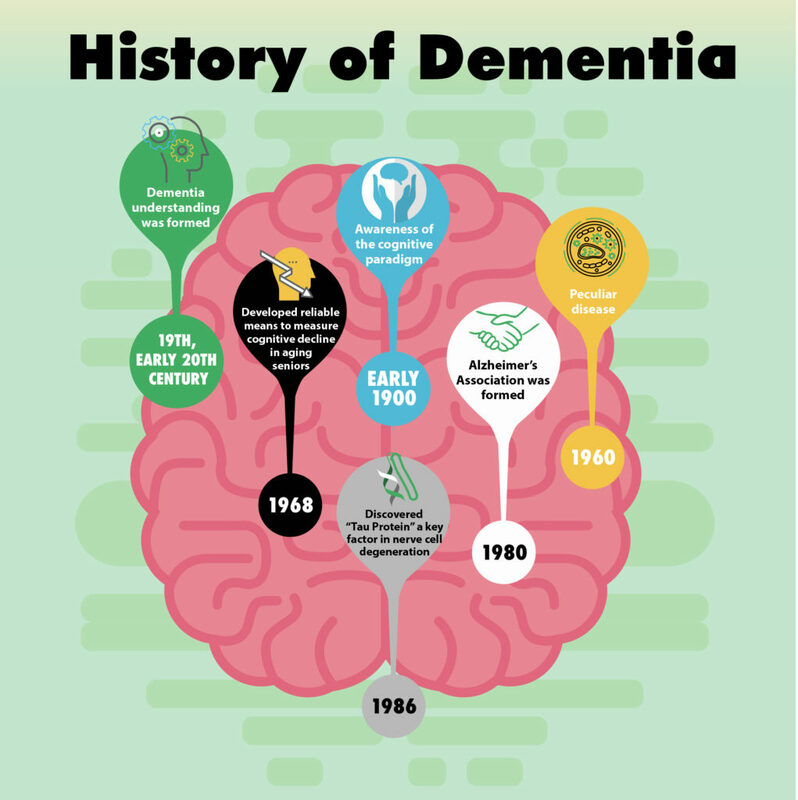 Dementia is rare in individuals under age 60 (Early Onset), and although it becomes progressively more common as we get older, it is not an integral or normal part of the aging process. Trauma to the brain, strokes, vascular issues, brain tumors, or a disease like Alzheimer’s, can cause dementia. The adverse changes in the chemistry and structure of brain cells that produce most types of dementia are degenerative, meaning they cannot be halted or reversed. For the most part however, their progression can be slowed slightly with treatments comprised of medications, healthy nutrition, and lifestyles that include physical and mental stimulation, and regular and plentiful sleep. In the early stages, damaged cells in the brain cause difficulties in remembering, learning and communicating. In time, as the dementia evolves, it spreads to additional areas in the brain and worsening symptoms, including difficulties in caring for oneself. At this stage, individuals require care and supervision from other family members and caregivers. Although dementia is probably as old as mankind itself, it was in the nineteenth and early twentieth centuries that our current understanding of dementia was formed. The early 1900’s saw the first awareness of the “cognitive paradigm”, i.e. the thesis that dementia comprised an irreversible degeneration of intellectual functions. Beyond that, each historical period has emphasized different symptoms and explanations. The early deliberations revolved around whether the cognitive failure and behavioral changes of dementia were simply part of the aging process. The year 1906 then saw a major milestone in the development of clinical Alzheimer’s in what Dr. Alois Alzheimer described as a “peculiar disease”. A year later, the German physician first linked symptoms in a 51-year old woman to microscopic changes in her brain’s anatomy. In the autopsy of her brain, he observed noticeable shrinkage and abnormal deposits around brain nerve cells known as neurons. It wasn’t until 1968 that researchers developed reliable means to measure cognitive decline in aging individuals. The Alzheimer’s Association was then formed in 1980, and another milestone was discovered in 1986, involving the Tau Protein, a key factor in nerve cell degeneration. Throughout those and subsequent years, clinical research has continued to make scientific advances, particularly in the fields of genetics, diagnostics, biomarkers, neuroimaging, and pharmacology. Although dementia is commonly associated with memory loss, everyone’s experience with dementia is different. Dementia can impact individuals in a gamut of other ways including changes in behavior and reasoning, inability to articulate thoughts or sentiments, personality changes, confusion, disorientation, paranoia, hallucinations, and in more unique ways. Despite the myth that dementia is only an issue in the western world, it is actually a global issue that is projected to incur its largest growth over the next several decades in India, China and developing countries. Another misconception about dementia is that it always fully incapacitates those it impacts. In fact, people with dementia have been known to adapt and learn to live well for a period of time with newly developed strategies and lifestyles. In addition, it is well-documented that women carry the largest part of the dementia burden. Dementia impacts women disproportionately in all parts of the world, and not only are women more likely to develop dementia than men, but the symptoms that women endure are generally also more severe. In addition, when it comes to caring for loved ones with dementia, it is typically women who do the heavy lifting: the caregiving workforce associated with dementia worldwide is also predominantly female. The number of people with dementia across the globe in 2016 is estimated at close to 50 million, and it is forecast to grow to 75 million by 2030, and to more than triple by 2050 (132 million). There are 10 million new cases of dementia worldwide each year, i.e. one new case every 3.2 seconds. 1.1% of global Gross National Product was expended on dementia in 2015; this breaks down to 20% for medical expenses, 40% for social programs, and another 40% for care. 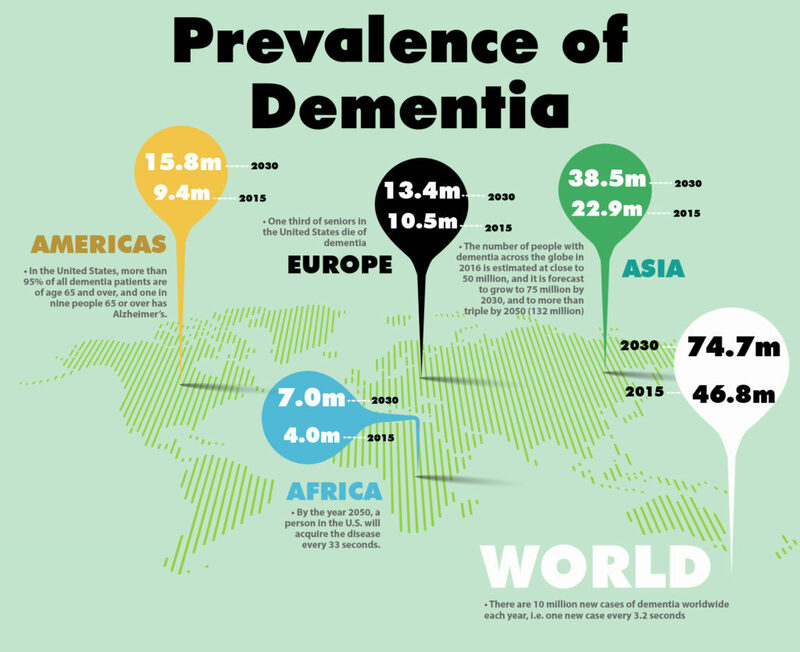 If global expenditures on dementia were a country, its economy would be the 18th largest in the world. There are over 100 types of dementia, although Alzheimer’s disease accounts to between 60 and 80% of those. Of the near eight million people with dementia in the U.S., almost six million have Alzheimer’s. By 2050, the expenditures incurred by Medicare and Medicaid on dementia will be in excess of $1 trillion. The 2016 Federal expenditure on Alzheimer’s and the other dementias aggregates to $236 billion. One third of seniors in the United States die of dementia. In 2015, more than 15 million people provided an estimated 18 billion hours of caregiving for people with dementia. Alzheimer’s is the sixth cause of death in the U.S. It kills more than breast and prostate cancer combined. The prevalence of those aged 60 and over ranges between 5 and 7% of the world population, with a higher (8.5%) occurrence in Latin American countries, and a lower (2% to 4%) prevalence in sub-Saharan regions of Africa. Further, almost 60% of people with dementia reside in countries with low and middle incomes, a statistic that is expected to rise to over 70% by the year 2050. In the United States, more than 95% of all people with dementia are age 65 and over, and 1 in 9 people 65 or over has Alzheimer’s. By the year 2050, a person in the U.S. will acquire the disease every 33 seconds. With the Baby Boomer generation currently reaching older age in large numbers, by the year 2050, the number of people with Alzheimer’s is estimated to increase from nearly six million to nearly fourteen million. Most forms of dementia disrupt cognitive abilities such as memory, communication, multi-step thought processes, reasoning, and judgment. The degree to which the disruption occurs varies, in part due to how advanced the disorder is. Individuals with dementia may also experience “psychiatric symptoms” such as irritability, anxiety, depression, agitation, sleeplessness, compulsiveness, paranoia, pacing, and/or delusions and hallucinations. 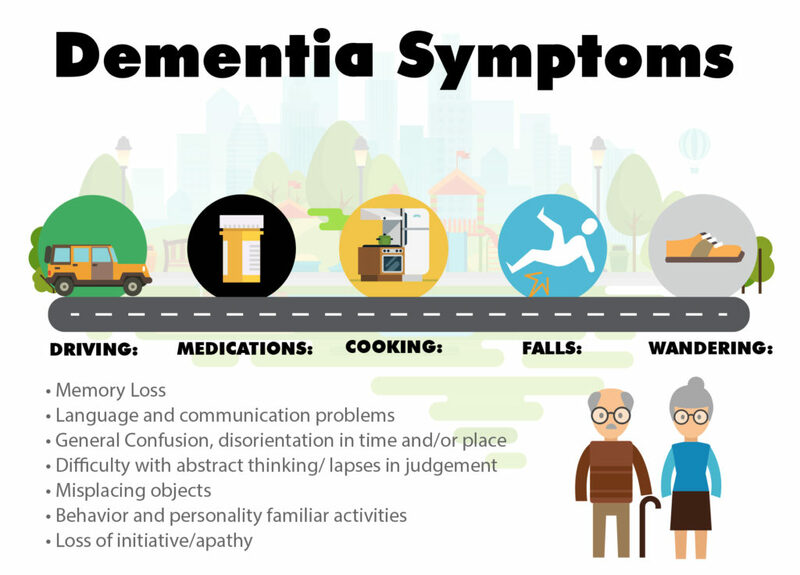 These symptoms, in combination with declining mental abilities, tend to make dementia significantly challenging for individuals with the disease and their caregivers. Though each type of dementia differs in symptoms and progression, there are some similarities as individuals progress from stage to stage. In the early stages of the disease, many people with dementia can still function independently, including holding jobs, driving, and remaining socially active. Difficulties may begin to arise when it comes to tasks such as balancing a budget, planning and organizing, and managing medications. Cues and pointers will then be needed to help the person with dementia stay as independent as possible for the longest duration. The middle stages are known to last the longest, often lasting for many years, and they typically require an incrementally greater level of care and support. In these stages, communication and the conduct of routine living activities become all the more difficult, and the caregivers can expect good days and days that are more challenging. The late stages may last for weeks or prolong to several years, depending mostly on the individual’s constitution, genes, and various other factors. 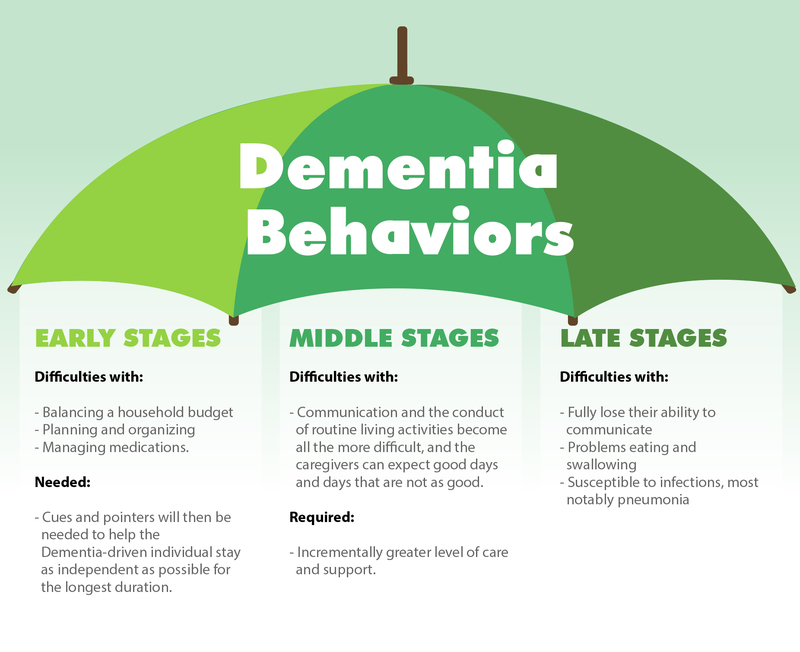 In these stages, individuals with dementia may fully lose their ability to communicate, although studies have shown that in some cases a connection can be maintained between those with dementia and their caregivers. Individuals in the later stages of dementia have significant problems eating and swallowing and require continuous assistance with incontinence and ambulating. Because of these problems, they become more susceptible to infections like pneumonia. Learn more about stages and progression of various types of dementia here. Because dementia can last for years, it is not commonly described as terminal, although in the end that is precisely what it is. The late stages of dementia typically present the biggest challenges for caregivers, mainly because of the loss of communication abilities. When people with dementia can’t communicate their needs or feelings, their caregivers are left with the difficult task of deciphering signs and reactions to stimuli. Providing emotional support can also become more challenging since caregivers may find it hard to convey personal and comforting sentiments when their loved ones may not recognize who they are. Caregivers in late stage dementia often resort to providing comfort through sensory connections, like a soothing touch, a gentle massage, or calming music. Research tells us that even with these kinds of connections, positive changes can occur in terms of mood, self-esteem, and well-being in those with late stage dementia. Because many people with dementia go without a diagnosis for long periods of time, they often misconstrue their abilities to carry on with daily life unimpeded. They may thus expose themselves and others to various hazards. Symptoms of dementia can include diminished decision-making and judgment abilities, which can occasionally jeopardize the safety of those with the disease. Every person with dementia will in time reach a point in the progression of their impairment where those caring for them should reconsider the person’s ability to drive around safely. Not only will people with dementia often not remember to take their meds in a timely fashion, but they also run the risk of taking the wrong meds or incorrect doses, which can have serious health consequences. This is an activity that brims with concerns when it comes to the distractibility, forgetfulness, and decreased ability to follow directions and “common sense” measures (especially risky behaviors like leaving the stove on). The risks of falls and injuries like broken bones and concussions are exacerbated in people with dementia who often misjudge their abilities or have an exaggerated view of what they can safely do. Wandering, perhaps second only to short term memory loss, may be one of the most serious concerns for the caregivers of people with dementia. Restlessness, irritability, sleeplessness, the urge to go to the bathroom, and the craving for food or water are only some of the reasons a person with dementia may stir about or wander. It has been found that when individuals with dementia are not found within the first 12 hours, one out of every 14 individuals do not survive, underscoring why it’s a very serious concern. At the golden age of 68, Margaret found herself living alone in the home in which she raised her family. Her husband had died, and her two children, Frank and Mary Ann, lived nearby with their own families. Margaret enjoyed baking, tending to her garden, and caring for her cat, Toby. It seemed to all in the family that she had everything she needed, including the ability to come and go as she pleased. That’s when Alzheimer’s reared its ugly head. By then Frank seemed at the end of his patience. “Even our specialists got stumped,” he commiserated. Dealing with a dementia diagnosis can be overwhelming, especially since most types of dementia are not treatable or reversible. Any kind of health problem can be frightening, but a condition that threatens memory, cognition, and language tends to be even more difficult to process. It is important to remember that you are not alone and there are many resources and forms of support available to you, such as telephone helplines and support groups. Hopefully this article provided a helpful overview to get you started.